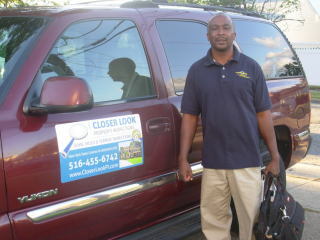 Closer Look Property Inspections, Inc. has been in operation since July, 2006. As a professional home inspector, I have performed hundreds inspections on all types of houses, from single families to multi family houses. I have done hundreds of inspections on condos, coops and apartments, as well as small commercial buildings. I keep up with all the latest building materials, their uses and proper installations. I am a Certified Pesticide Technician with New York State Department of Environmental Conservation. Upon request and an additional fee I can perform Termite Inspections and issue the NPMA-33 form required by lenders and banks. I am a Certified Mold Inspector with the International Association of Certified Indoor Air Consultants. When performing a mold inspection air and surface simples are taken to determine if mold is present, as well as what type of mold, how much of it exist and its likely health effects. Eric Middleton, owner /operator, is a certified home inspector. Based in Uniondale, he services Nassau and Suffolk counties and the five Boroughs- Brooklyn, Queens, the Bronx, Manhattan, and Staten Island. Termite Inspector with the Department of Environmental Conservation. Infrared Certified with the National Association of Certified Home Inspectors. View our pest control website: EM Pest Control Inc.